What are Chakras? - ​Welcome to​Inner-Soul Coaching! The word chakra means "wheel" in Sanskrit. There are 114 chakras and 72,000 nadis in the body. Nadis are the equivalent of meridiens in Chinese medicine. These are the energy channels that are manipulated in acupuncture treatments, the pathways in which energy flows through the body. The 7 chakras that are normally referenced in energy healing are the main wheels of energy that are located from the base of the spine to the top of the head. 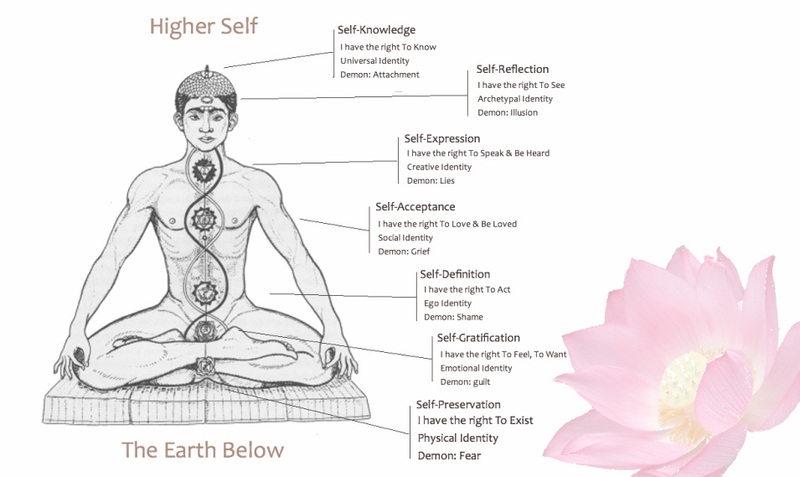 Each chakra is structured uniquely to receive and transmit the particular qualities of energy which are necessary for the area of functioning governed by the chakra. Each chakra has an energetic correspondence to the physical body, being associated with a gland and major nerve plexus, and governs the area of the physical body in which it is found. Each is also associated with a color, shape, symbol, sound, and energetic function. The chakras are inter-related and work synergistically. The chakras are associated with life issues and are considered the energy points through which you interact with the world- how you give and receive energy. Meditation, quiet breathing, and mindfulness will center you and help balance your chakra.